Sebaceous carcinoma is a rare and an aggressive tumour. It can occur anywhere on the body where sebaceous glands exist. The common site of involvement is the periocular area and it comprises 1–5.5% of malignant tumors of the eyelid. It is often missed clinically as it mimics benign conditions such as blepharoconjunctivitis or chalazion. Here, we report a case of sebaceous carcinoma of upper eyelid that was diagnosed when it presented as submandibular lymphadenopathy. A 65-year-old female presented with a painless swelling at the left angle of mandible since 2 months [Figure 1]a. On examination, a firm, mobile, nontender, submandibular swelling of size 3 × 2 cm was palpated. The overlying skin was pinchable. Fine needle aspiration cytology (FNAC) was performed using a 23-gauge needle and a 10-ml syringe. Papinicolaou and Giemsa stained smears were prepared; they were moderately cellular and showed a prominent lipid rich background with cells arranged in syncytial aggregates and loose clusters. The cells had centrally placed hyperchromatic nuclei, prominent nucleoli, and abundant cytoplasm packed with variably sized cytoplasmic vacuoles. Atypical mitotic figures, apoptotic bodies, scattered bare nuclei, and many lymphoid cells were also seen [Figure 1]c, [Figure 1]d. The differentials considered were primary sebaceous carcinoma of the salivary gland, cutaneous adnexal neoplasm with sebaceous differentiation, metastasis of renal cell carcinomas (RCC), and metastasis of sebaceous carcinoma. However, the lesion was free from the overlying skin, had numerous lymphoid cells in the background, and lacked the typical thin vascular cores seen in a RCC. The cell morphology was typical of sebaceous cells, and hence the patient was re-examined; a painless yellowish indurated ulcer with loss of eyelashes was found at the left upper eyelid [Figure 1]a. A diagnosis of metastasis of sebaceous carcinoma was rendered. The patient underwent eyelid surgery with neck dissection but was subsequently lost to follow up. Sebaceous carcinoma arises from the Meibomian gland More Detailss of the tarsal plate, glands of Zeis, or from sebaceous glands of the eyebrow skin. This is an aggressive tumor and local recurrences as well as metastasis are very common., Preauricular and submandibular nodes are the usual sites of lymph node metastasis. It appears as a firm, painless, indurated nodule, or ulcer associated with loss of eyelashes, and simulates benign conditions such as blepharoconjunctivitis or chalazion. Thus, it may often be overlooked or undiagnosed. A delay in the primary diagnosis may lead to its presentation as metastatic adenopathy, as was seen in our case. The diagnostic cytomorphological features of sebaceous carcinoma is a lipid rich background with polygonal cells having centrally placed hyperchromatic nuclei and multiple, variably sized cytoplasmic vacuoles., The lipid rich background and cytoplasmic vacuoles are very evident on Giemsa-stained smears as compared to Papanicolaou; we routinely use and recommend the use of both Giemsa and Papanicolaou stains for all aspirates. A cytologist should be aware of the cytomorphology, clinical presentation, and behavior of sebaceous carcinoma to ensure timely management. 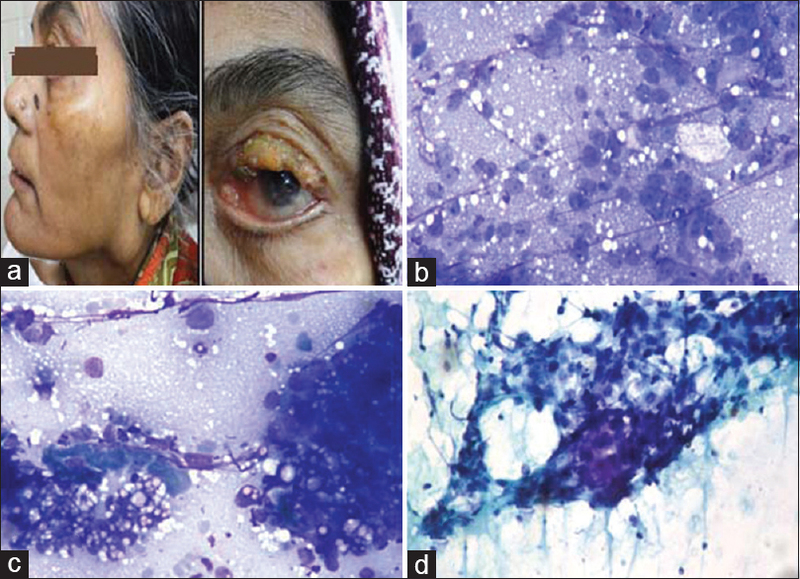 Gill M, Garg S, Kalra R, Sen R. Sebaceous carcinoma of the eyelid diagnosed on fine needle aspiration cytology. J Cytol 2012;29:75-6. Gardetto A, Rainer C, Ensinger C, Baldissera I, Piza-Katzer H. Sebaceous carcinoma of the eyelid: A rarity worth considering. Br J Ophthalmol 2002;86:243-4. Maheshwari R, Maheshwari S, Shekde S. Role of fine needle aspiration cytology in diagnosis of eyelid sebaceous carcinoma. Indian J Ophthalmol 2007;55:217-9. Jain P, Nanda A, Handa U, Bal A, Mohan H, Gupta SK. FNA diagnosis of recurrent sebaceous carcinoma. Diagn Cytopathol 2006;34:124-6. Stern RC, Liu K, Dodd LG. Cytomorphologic features of sebaceous carcinoma on fine needle aspiration. Acta Cytol 2000;44:760-4.